Brian M. Boom, Ph.D., is the Vice President for Conservation Strategy and Bassett Maguire Curator of Botany, and Daniel Atha is the Director of Conservation Outreach at The New York Botanical Garden. Ashes comprise one of North America’s most widespread and ecologically important groups of trees. Yet since 2002 an invasive beetle, Emerald Ash Borer (EAB), has killed tens of millions of Ash trees across the Midwest and this pest is moving rapidly eastward through New York and New England. Ash tree mortality is nearly 100 percent within several years of beetle infestation, and there are no viable biological or chemical control solutions at the landscape level. Most conservation efforts on behalf of North American Ashes have focused on controlling the EAB. With generous support from The Manton Foundation, The New York Botanical Garden has taken a different approach, one focused on documenting and characterizing Ash species diversity, and searching for rare individual trees that might have resistance to the EAB. Such trees are termed “lingering” Ashes—trees that appear healthy in the midst of a stand of EAB infestation. The only way to preserve the role of Ash trees in their native habitats may be through breeding of lingering Ash or genetic manipulation of resistance traits. As part of this project, NYBG established a citizen science project in the Catskills region, which is the most intensively EAB-impacted part of New York State, and indeed in all of the Mid-Atlantic and New England regions. 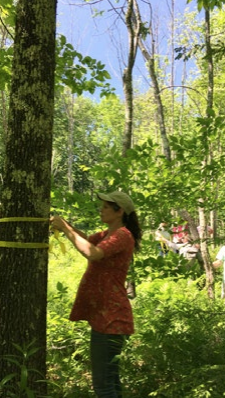 Since spring 2018, the project has established the target of five study plots in Catskill forests having heavily devastated Ash populations, and from regional workshops has recruited a small team of citizen scientists. These dedicated volunteers are scanning the Catskills’ forests for elusive lingering Ash trees, which, if detected, NYBG will report immediately to the USDA Forest Service’s EAB-resistant Ash tree breeding program. But this large and important project needs MORE citizen scientists. This article originally appeared as part of a series on responsible citizenry in the 2018–2019 issue of Garden News, NYBG’s seasonal newsletter. For further reading, view the issue online and discover a sampling of stories about our current efforts and activities that promote, engage, and support active and responsible citizenry on local, regional, and global levels.